Casa Leandrón was built before the year 1700 and reformed in the year 2001 conserving all the exterior walls. Rebuilt in its entirety, maintaining the traditional structure, it has five double bedrooms, three bathrooms, kitchen - dining room with fireplace and living room with three large sofas and wifi area. with tv Outside there is a terrace and barbecue, ideal for summer dinners, with outdoor furniture, along with a small kitchen to support the barbecue. For groups of more than 12 people, consult us about Casa LEandron II, up to 6 or 8 people. Sometimes the most numerous families reserve the two houses, giving rise to 21 places. In both houses there are board games and information of the area. Just 4 minutes away on foot is our adventure company www. alcorcerafting. com .. we have important discounts for all those staying at Casa Leandrón. We reserve activities for you at no additional cost. 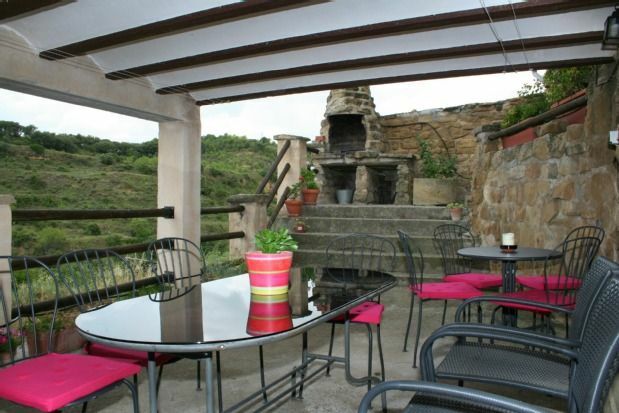 Each house has its own terrace with barbecue. - Casa Leandrón consists of: - Kitchen-dining room with fireplace and dishwasher (dining table of 2.70 meters) -Living room with television - 5 double rooms (three of them have double beds) - 3 bathrooms (two of them inside rooms) with hair dryer - A lovely terrace with barbecue and summer furniture, ideal lunches and dinners - Casa Leandrón II, located in the old cellars of the house, recently restored in 2005, it consists of: - 3 double rooms (for 6-8 people) - Living room - fully equipped kitchen with dishwasher - Two bathrooms with a hairdryer - A lovely terrace with barbecue and summer furniture. - Option of extra bed and cot (ask). Possibility of booking the two houses for groups of friends or large families. Ask us, Free wifi in both houses. In Murillo de Gallego, we have our own activities company www. alcorcerafting. com with discounts for all staying at Casa Leandron.